Author enlivens guidebook with tasty tidbits of information. From the beginning hiker looking for a place to start to the experienced outdoorsman in search of the next great adventure, E. Dan Klepper’s 100 Classic Hikes in Texas is a must-read. Each hike is rated by difficulty in a handy chart that indicates the region and preferred season for hiking that trail and includes a particular perk to spark a reader’s interest. After whetting your hike-happy appetite, Klepper provides a necessary overview of Texas-specific hiking safety information. Some may be tempted to skip over it, but Klepper’s friendly, matter-of-fact tone and interesting anecdotes avoid the preaching and stick to the practical. 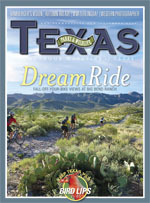 100 Classic Hikes in Texas offers detailed hike descriptions, sectioned by region. The individual trail synopses offer basic information, such as maps, helpful statistics, available views and driving directions. But they are also rich with fascinating historical and ecological tidbits, giving each trail a personality and each summary the feel of a tantalizing movie preview. These insightful descriptions and beautiful photos are enough to persuade anyone to get out for not just a hike, but also a Texas-sized adventure.